Home » Posts tagged with "false advertising"
Ad Standards has confirmed that a misleading transit ad campaign from the Dairy Farmers of Canada has been removed! 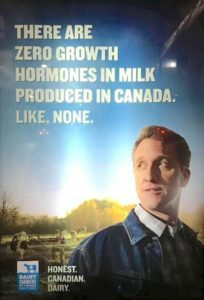 The advertisement claimed “there are zero growth hormones in milk produced in Canada”, but this is entirely false. IGF-1 is a naturally occurring growth hormone that is present in all cow’s milk, which helps turn calves into thousand-pound adults. When Animal Justice heard from concerned citizens who were appalled by the dairy industry’s deceitful ad campaign, we assisted the public in filing complaints to the national regulator. We’re pleased that the truth prevailed, and that the dairy industry is no longer permitted to advertise through this unlawful, false messaging. Full view of the misleading transit ad. Many Canadians are shocked to the learn that the dairy industry has a $80 million annual advertising budget, duping people into drinking milk that is inherently cruel to animals, linked with health problems, and detrimental to the environment. This is not the first time that the dairy industry has tried to mislead consumers through false advertising. Back in 2016, Animal Justice filed a complaint with authorities when the Dairy Farmers of Canada partnered with health agencies to run ads suggesting that daily dairy consumption was necessary for good health. In fact, dairy is not a necessary part of the human diet and can in fact have adverse health effects. It’s clear that the dairy industry is feeling the pressure of an evolving society that is looking to more humane, healthy, and sustainable alternatives to traditional dairy products. Plant-based milks now make up nearly 10% of all milk sales, and according to Statistics Canada, milk consumption has fallen by 21.5% per capita since 2009. Dairy was even booted from having its own food group in the new plant-focused Canada Food Guide. This massive societal shift to plant-based milk products will only continue to grow. Here’s to a future that is dairy-free, and better for everyone! Animal Justice won a victory against the cruel circus industry today, with news that the Toronto Transit Commission (TTC) has removed misleading ads paid for by the Shrine Circus. The ads were removed following complaints made last month by Animal Justice and Len Goldberg, a witness to the ads.. The false transit ads promoted the Shrine Circus’ 2016 summer “Spectac!” tour in Southwestern Ontario, and featured a photo of an elephant in the midst of a circus performance. In reality, there were no elephant performances this year in Shrine circuses. U.S. authorities cancelled permits on April 21, 2016 for two endangered Asian elephants named Shelley and Marie to be transported from the U.S. to Canada so they could be forced to perform in Shrine circuses. Shrine Circus contractor Tarzan Zerbini failed to meet even the minimal standards in place for the export permits, which is why they were cancelled. Animal Justice and Mr. Goldberg filed complaints with Advertising Standards Canada, a national advertising self-regulatory body. Advertising Standards Canada advised in a letter today that the TTC at once took steps to remove all remaining ads when it was notified of the complaint. There is a growing public sentiment that it is unacceptable to confine elephants in zoos or force them to perform in circuses. The Toronto Zoo and most other Canadian zoos have already sent their elephants to sanctuaries, recognizing that elephants have complex social and behavioural needs that cannot be met in captivity. Rather than clinging to exploitative and outdated elephant performances, the Shrine Circus should give up elephant acts for good, like Ringling Brothers and Barnum & Bailey did earlier this year.